I am excited that Andreae Downs is running for City Council as a Ward 5 Councilor-At-Large. I met Andreae seven years ago working on safe sidewalks, an effort to improve sidewalk access in the winter. During this effort, she demonstrated a strong understanding of the political process, a willingness to compromise and ability to marshal resources. Andreae and I continue to work together on transportation issues. As the Chair of the citizen Transportation Advisory Group, Andreae has been responsible for the running of this group that works with city staff and elected officials to improve transportation in the city. Andreae continues to impress me with her energy, understanding of complex issues, positive attitude and ability to think creatively. ​Newton has many important issues to deal with in the coming years, transportation, stormwater (another topic she knows a great deal about), finance, housing and development, zoning and public buildings among others. I have no doubts that she will challenge her fellow councilors to think and act more strategic and be far more innovative. I also believe she will be a strong advocate for residents in Ward 5 and beyond. I will be voting for Andreae on November 7th and I hope you do as well. I am happy to endorse Andreae Downs for Ward 5 At-Large City Councilor. I have known Andreae for many years, as a friend and neighbor, and as a fellow Waban Area Councilor. Andreae has the temperament and work ethic to be an effective City Councilor. She is open-minded and respectful of different points of view. On WAC, she has worked hard to promote improvements to greenspaces, and to advocate for better traffic designs at Angier and Zervas. In the case of Zervas, she quickly organized a well-attended community meeting that ensured that neighbors and parents would be heard on traffic design. She will bring that same attention to neighborhood concerns to the City Council. Anyone who knows Andreae can attest to her near obsession with transportation issues. She has a visionary rather than a reactionary approach when it comes to traffic and transportation, and will work for safer streets, better parking management, and better pedestrian and bicycle access. She has the breadth of knowledge to back up that vision, having served as chair of the Mayor’s Transportation Advisory Group since 2011. Andreae’s focus on transportation influences her views on development. When she talks about “smart” development, she really means it; it isn’t just a buzzword to be applied to any new project located near a T-stop. When WAC responded to two proposed 40B developments, Andreae advocated for better designs that would promote walkability and traffic safety, and that would result in fewer cars. I encourage voters to learn more about Andreae’s unique vision at andreae4newton.com, and to vote for Andreae on November 7th. Newton’s City Council is composed of dedicated people who work hard to represent us and who each bring special expertise to the job. A key area where we need more expertise is in transportation - which accounts for a third of our energy use – and sustainable land use. Together they shape Newton’s quality of life and our contribution to a more sustainable world. Andreae Downs has the energy and the expertise to be a leader in this area. She has put in years of service in the League of Women Voters, and she chairs the Mayor’s Transportation Advisory Group. She is an advocate for improvements to safety for pedestrians and cyclists. Andreae leads by example. You’ve seen her on her bicycle all over the city. She has worked to achieve safer access to our new schools, improve our streets and sidewalks, and protect our green spaces. I know her, and I know that she will do an outstanding job representing our ward and working with other progressive City Councilors to make Newton a safer and more livable place. I’m voting for Andreae Downs for Ward 5 Councilor-at-Large, because, to paraphrase the song from Hamilton, I want Andreae in the room where it happens. Having worked side-by-side with Andreae for seven years on the mayor’s Transportation Advisory Group (TAG), which she chairs, I know firsthand Andreae’s commitment to addressing global climate change and providing streets that are safe and inviting to all users and promote more walking and biking. I have watched Andreae advocate tirelessly and effectively for safe street design around our new schools, for transportation solutions that provide seniors with meaningful mobility options, for human-scaled infrastructure that will breathe new life into our village centers. I have watched Andreae dive deep into technical minutia and emerge expert on modern roadway design, urban planning, mass transit, the evolving bike-share industry, and a host of other topics. I have watched Andreae listen intently, argue persuasively, and gain the trust of community members, city staff, and other stakeholders. I look forward to Andreae bringing her passion, intelligence, coalition-building skills, and progressive vision to the larger stage of the City Council and to a broader array of issues, like affordable housing and sustainable economic development. Newton needs Andreae in the room where it happens: Council Chambers. Andreae Downs is running for Councilor-at-Large from Ward 5. I have known Andreae for nearly 30 years. We raised our kids together, shared gardening tips and divided iris, went camping together with our families. We nurtured our children together through the ups and downs of high school, college applications, and now the transition to adulthood and careers. Parenting alongside her, I saw her strengths and values. Knowing Andreae as I do, I am convinced that she would be an outstanding council member. There is no pretense about her, nothing inauthentic. She is an uncommonly strong and caring person, with a deep commitment to sustainability, diversity, and education. She lives those values in her everyday choices--frequenting the Newton farmer’s market, biking to work, experiencing other cultures through travel, volunteering in the schools, and helping when a neighbor needs a hand. Andreae is a highly skilled person, whether the task is managing traffic, making our villages more vibrant, or planning a gathering of friends. If you need to get something done, Andreae is the person to ask. Her strength, caring, and energy have come through in her campaign as she's canvassed tirelessly throughout the city. Andreae is full of ideas and eager to make a difference. Please join me in voting for her on Nov. 7! As a former alderman, what do I look for in a candidate when picking a candidate for whom I should vote this November? 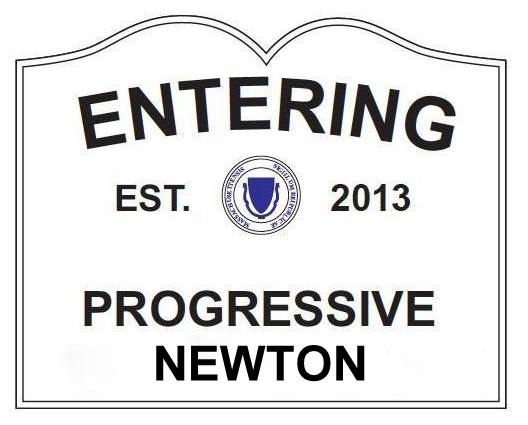 I look for someone who has bold aspirations for what the city can be, and is not willing to accept the status quo; who has the drive to learn and share ideas on how we get there as a community; who possesses the willingness to ask questions and listen carefully and who will bring new ideas to move Newton forward to meet our challenges. If that is what you look for, then I have the candidate for you: Andreae Downs, Councilor-at-large, Ward 5. For many years, Andreae has been a tireless advocate for making our community safer and more accessible for pedestrians, bicyclists, and motorists. She stands out as someone who has connected the all important dots of transportation, housing diversity, and affordability--all of which are critical for Newton’s seniors, the city’s workforce, and young adults who want to live, work, and play here. Another top priority for Andreae is the environment and its sustainability. Knowing what is going on in the world today, she knows that it is important that we start here at home by investing to solve multiple problems, whether that is creating energy efficient public buildings or the installation of solar panels. Andreae will collaborate with the School Committee to ensure that our educational system continues to be a hallmark for Newton. What this means to her is that the schools are funded at the appropriate level to meet needed programming, that all educational opportunities are affordable for all families and that we hire, develop and retain the best educators and support staff possible. So please join me in voting for Andreae. She will not shy away from the challenges that we face but will work hard for you and me with energy, creativity, honesty and integrity. knowledge, commitment, vision, and capacity for innovative problem solving in the transportation-housing nexus. Andreae knows how to convene people around shared values, like walkable streets in mixed use, transit oriented village centers, while finding win win solutions that, for example, can provide convenient parking for mobility challenged seniors and allow younger people to have safe and healthy mobility options. A vote for Andreae is a vote for cleaner air, healthier people, thriving village centers, and climate leadership. 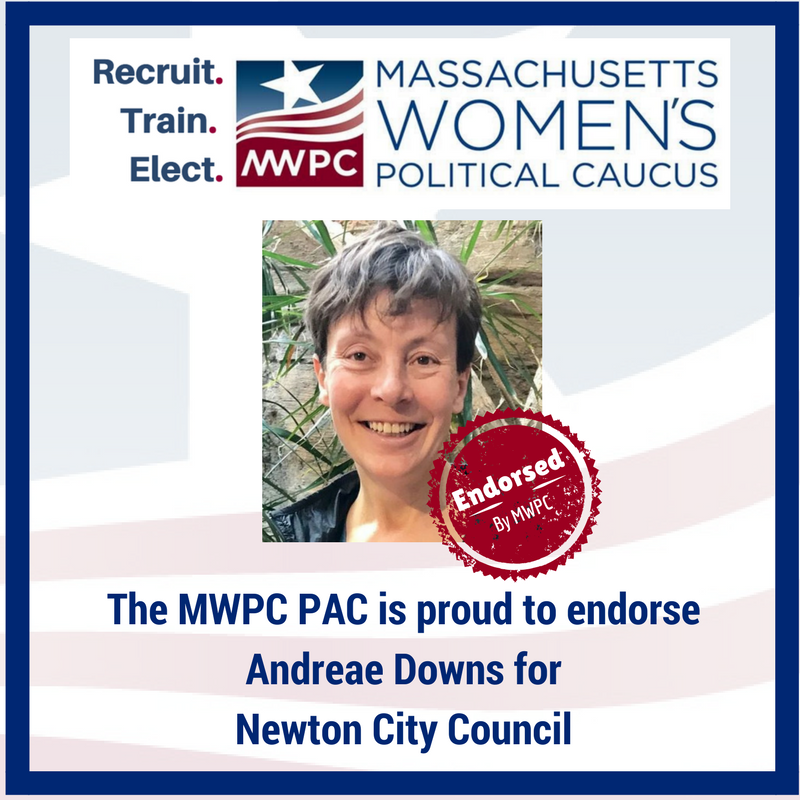 I hope you'll join me in supporting Andreae Downs with your vote!